2019 Shelby Mustang GT500 Leaked On Instagram! Ford execs must be busy right now, trying to find out who leaked the image in the first place. This one is BIG! And Instagram turns out to be the place where the first picture of the 2019 Shelby Mustang GT500 showed up. Unofficial and leaked. While the entire motoring journo world hunted desperately for an unofficial image of the 2019 Shelby Mustang GT500, it was a 20-year old guy from Detroit who actually managed to get one. Kyle wasn’t slow at all in revealing it to the world through his sinister_lifestyle Instagram page too. So here it is – the all-new Shelby Mustang GT500 – with its first image leaked online. One of the popular theories on how a 20-year old chap from Detroit got hold of an image like this, is that the image may have been taken by one of the attendees at the national dealer meeting in Las Vegas this week. The whole display stage setup cements that theory in place as the best one. The official unveiling of the 2019 Shelby Mustang GT500 will happen in Detroit during the North American International Auto Show scheduled for January 2019. 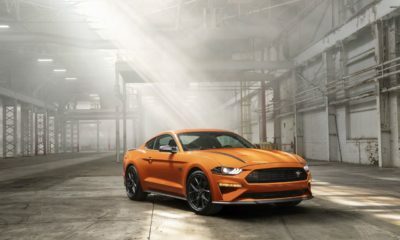 Jalopnik (among a dozen others) immediately picked up Kyle’s Insta upload to support their write-up and states that the entire front section of the Mustang in the leaked image is in line with the official teaser image released back in March. 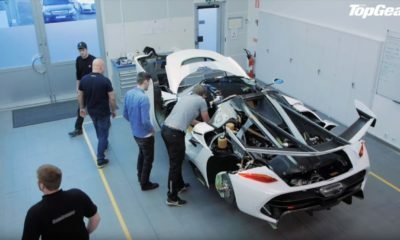 Even the rear spoiler, color scheme and the hood vents are the same as seen in another official teaser image. While details on the power and performance are not around in official capacity, some of those rumors suggest the new 2019 Shelby Mustang GT500 to be powered by a 770 hp supercharged V8. If that holds to be true, you are looking at the most powerful street-legal Ford in history. The big badass official debut is set for the 2019 North American International Auto Show in Detroit. Until then, let’s hope that Kyle and his mole inside the Ford dealer network doesn’t get into serious trouble for the leak.